Friends of the River San Bernard Scholarship Program awards six - $1,000 scholarships annually to graduating seniors who live in or attend a high school whose district is within the San Bernard watershed. They must demonstrate a direct connection between their career path and the betterment of the environment. 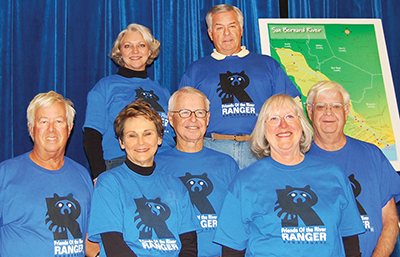 Friends Of the River San Bernard Ranger Program is an educational program for fifth grade students to raise their awareness of the San Bernard River watershed and its environmental concerns. FOR Rangers thanks BASF for supplying the Ranger t-shirts this upcoming school year. Presenters and assistants were l. to r., Bob Bailey, Adalia Maudlin, Nancy Kanter, Susan Bailey, Mike Goodson and Ken Wright. Not in picture, Linda Wright. On May 21, 2010, F.O.R. River Rangers presented its second May classroom program to the fifth grade students at Stephen F. Austin Elementary School in Jones Creek. Students learned about the importance of a healthy San Bernard River watershed, fish identification and nautical knot tying. A raffle awarded three students with new fishing rods. Packets of information about the San Bernard and t-shirts were also handed out. A Friends Of the River Ranger classroom program was presented to the fifth grade classes of East Bernard Jr. High School, East Bernard, Texas on May 14, 2010. The presenters and assistants were, l. to r., Bob Bailey, Adalia Maudlin, Nancy Kanter, Mike Goodson, Linda Wright and Ken Wright. T-shirts and information packets were handed out to students. Four rod and reels were awarded to students whose names were chosen in a random drawing.